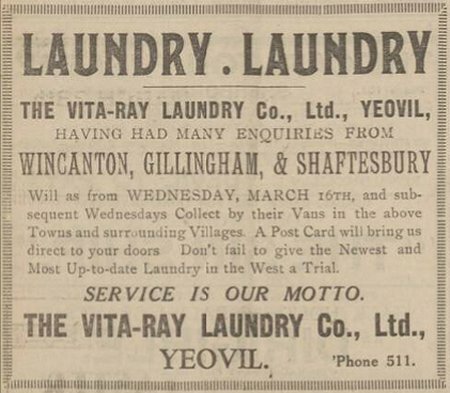 The founding of the new Vita Ray Laundry Co Ltd was announced in the 16 April 1930 edition of the Western Gazette with the laundry itself opening on 1 September that year. 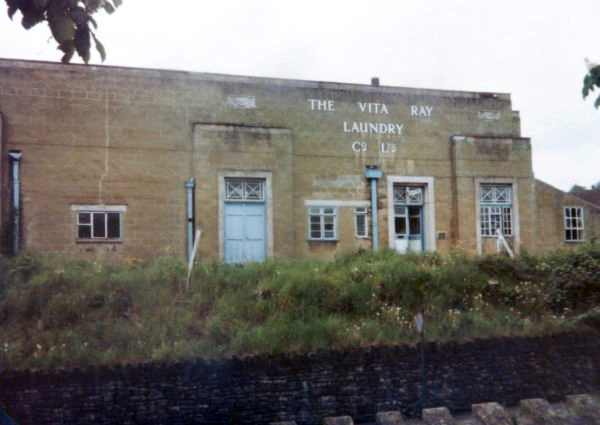 The Vita-Ray Laundry was sited on the lower slopes of Wyndham Hill adjacent to the Sherborne Road close to the junction with Lyde Road. There is very little information today concerning the laundry, however it was listed in Kelly's Directory of 1935. It was also listed in Edwin Snell's Directory of 1954 and the advertisement below was placed in the 1967 Yeovil Guide. By 1978, the date of the two photographs below, the laundry had closed. The site is now housing. 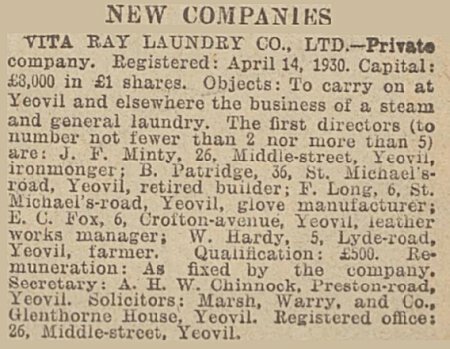 The founding of the new Vita Ray Laundry Co Ltd was announced in the 16 April 1930 edition of the Western Gazette. 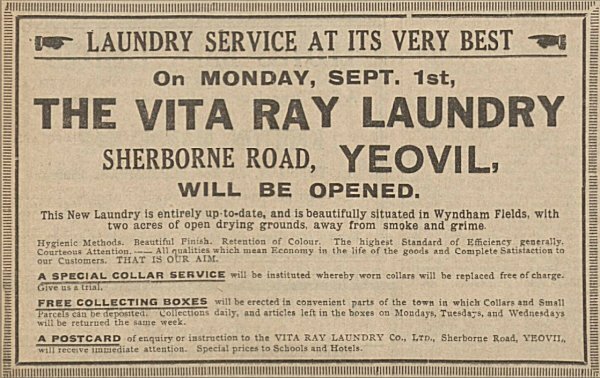 The notice placed in the 29 August 1930 edition of the Western Gazette advertising the opening of the Vita Ray laundry. .... and the laundry hadn't been open for very long, when this item appeared in the Exeter & Plymouth Gazette's edition of 23 October 1930. By the time of this advertisement in the Western Gazette, 11 March 1932, the business was growing and expanding its customer-base far and wide. 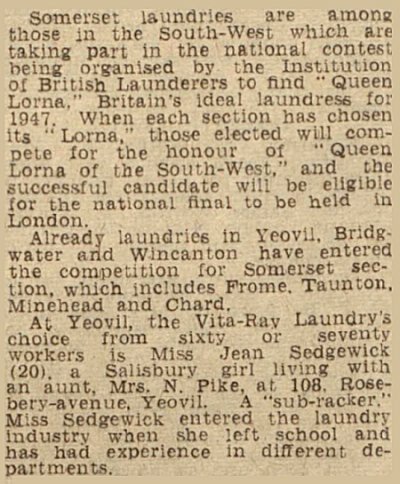 Throughout the 1940s there was an annual nationwide competition to find a "Queen Lorna", Britain's ideal laundress announced in the Western Gazette - this particular item appeared in the 16 August 1947 edition. I have yet to find a Somerset winner of the competition, but at least Yeovil took part every year. 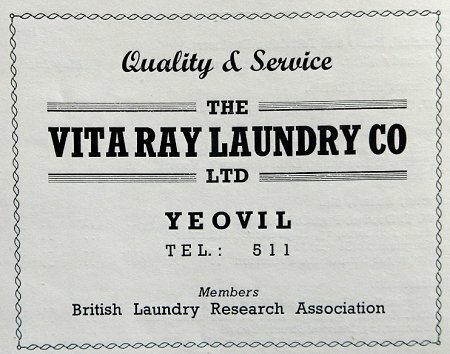 An advertisement for the Vita Ray Laundry Co Ltd in the 1961 Yeovil Rural District Official Guide. 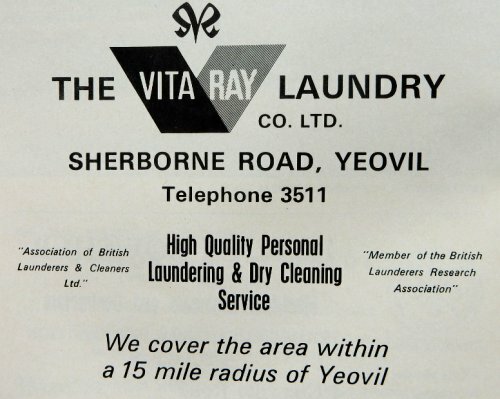 The Vita Ray Laundry Co Ltd's advertisement in the 1967 Yeovil Guide. 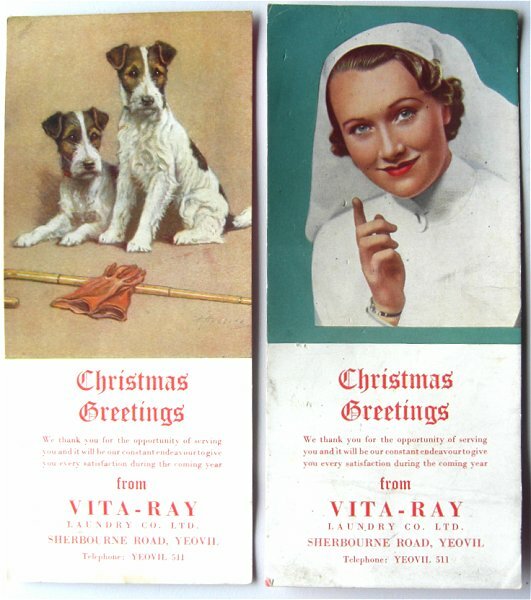 Christmas Greetings from the Vita-Ray Laundry Co Ltd. I wonder if anybody noticed the spelling of "Sherbourne"? 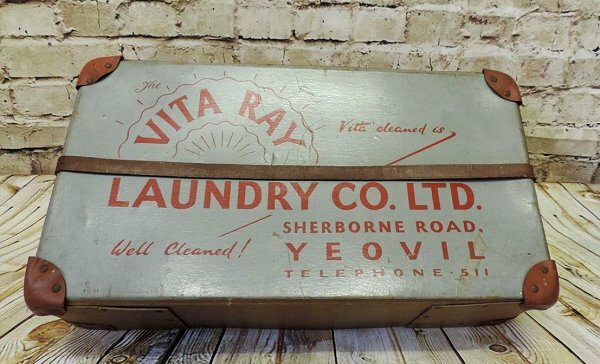 A laundry box used by the Vita Ray Laundry. It is a heavy duty box measuring 22" x 12" x 6" high (57cm x 30cm x 16cm) and made of heavy board riveted together with leather corners and a leather strap fastener. It was made by the Enfield Box Co in September 1959 and had a two year guarantee. 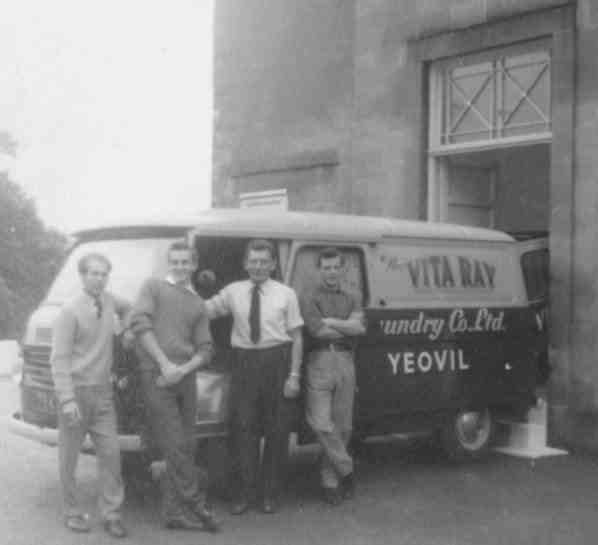 Vita Ray workers pose for a photograph with their van in the 1960s. David Lumsdaine is at far right - does anyone know the names of the others? Courtesy of Colin Haine. 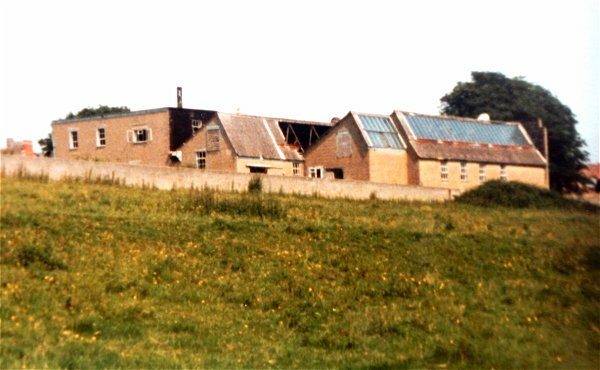 This photograph features in my book "A-Z of Yeovil"
The front elevation of the Vita Ray Laundry, seen from the Sherborne Road and photographed around 1983. The Vita Ray Laundry photographed from Wyndham Hill (looking northwest) in 1978. 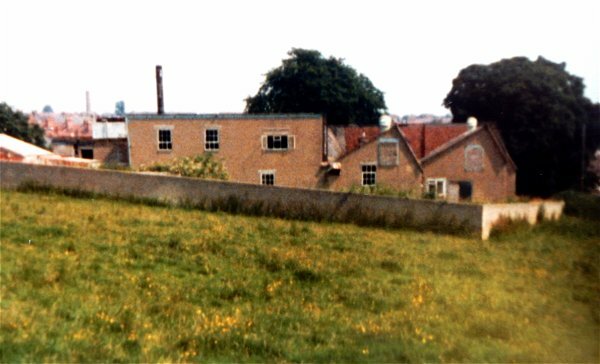 The Vita Ray Laundry photographed from Wyndham Hill (looking north) in 1978. 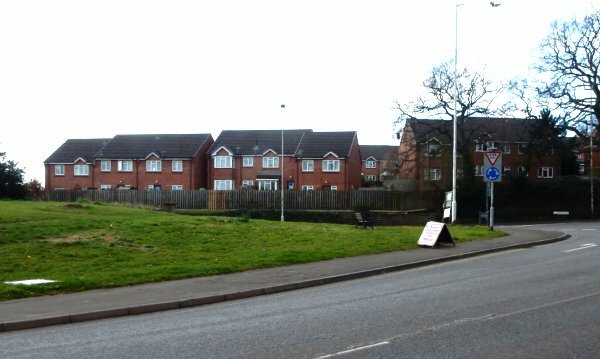 Photographed in 2015 from Lyde Road looking across to Sherborne Road, housing now occupies the Vita Ray laundry site.